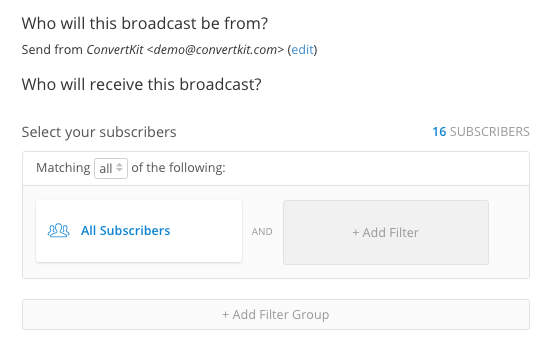 Get the most out of Broadcast filters, and Filter Groups! You might need to email a specific group of Subscribers, but not everyone on your list. With our Broadcast Recipient Selector, this is really easy! Here's how it works. Create a New Broadcast, and you'll be taken first to the Recipients page. 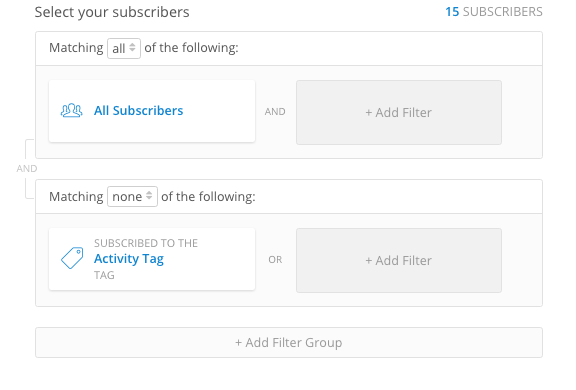 By default, you'll see the filter group "All Subscribers." Click "Add New Filter Group." Click "select to choose from Forms, Sequences or Tags. Select the tag you want to exclude. Now changes "Matches: ALL" to "Matches: None." Note: You can add as many Tags as you'd like to one Filter. 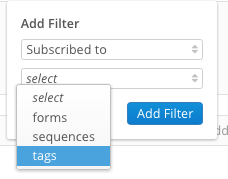 If you'd also like to exclude any Forms or Sequences, you'll want to create a Filter. The difference in the number of Subscribers means it'll be sending to everyone on the list that does not have the Activity Tag.